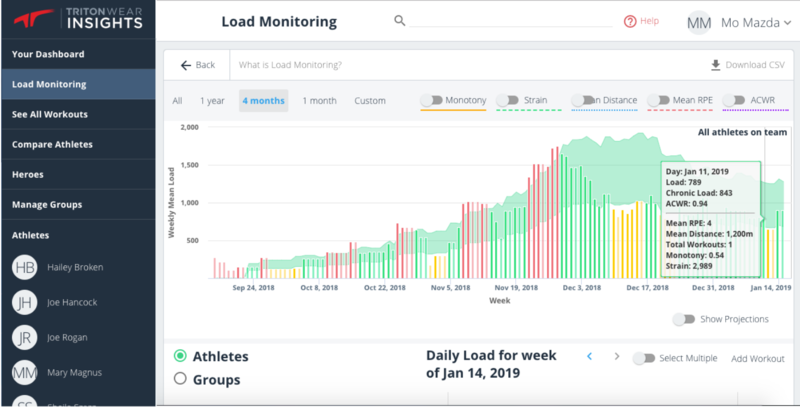 The Training Load Graph provides a detailed overview of an athlete or a team’s load monitoring data and readiness to train. Depending on your settings, you will either see a bar for every day or week. The bars for days or weeks with no recorded workouts will be in lighter, less transparent colours. Each bar represents load for the past 7 days. Hover over the bar to view more data for the day/week. You can read more about the different training load methods here. The green band behind the bars represents “the sweet spot”. This is the training load that athletes need to target to achieve peak performance and lower risks of injury. A green bar indicates that the selected athlete(s) hit their optimal load. An amber bar indicates that the selected athlete(s) fell short of their optimal load (undertrained). Increase their load in the following week to bring them back into the green zone. The goal is to consistently stay green. When you hit a red or amber bar, you can find suggested training load, including volume and intensity recommendations, by turning on the Show Projections toggle, or clicking Tomorrow’s Target Load. Read more about hitting your target load here.